DART_MOBO based controllers can be equipped with 2 spinners that can turn infinitely, like a dj turntable/jog wheel, and that are designed to interact closely with touch sensors. in the images below the top and side spinner have been enriched with customized logos. Spinner configuration using the DART_EDITOR. In the following example we are using the DART_EDITOR to open the DART_ONE default preset and select the ITEM related to the TOP SPINNER. SPINNER1 – for the TOP spinner. SPINNER2 – for the SIDE spinner. 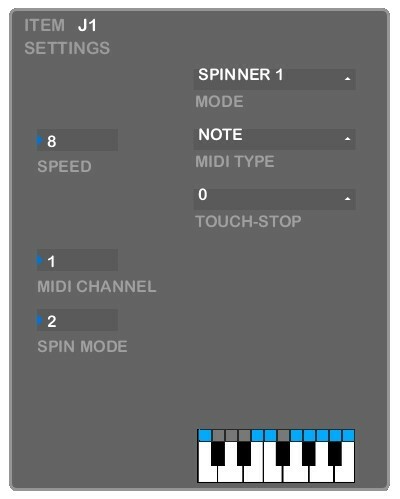 Only one ITEM can be set to SPINNER1 or SPINNER2 in a preset. MIDI TYPE – to select the type of MIDI message that will be controlled by the spinner. CC is the most suitable type of message when the SPIN MODE parameter is set to ENDLESS MODE or POT EMULATION MODE. NOTE is the most suitable type of message for the SCALE MODE, described below. PITCH BEND can be selected when SPIN MODE is set to POT EMULATION. In combination with the Touch_Reset function it is possible to emulate the classic tonal control lever of a synth-keyboard, with automatic return to an intermediate position. DATA BYTE 1 – to select the Number of the NOTE or CC message. MIDI CHANNEL – to select the channel (1-16) of the MIDI message. 0 = ENDLESS MODE 1 – the output midi message has a data byte 2 with a value greater than 65 i less than 63 according to the clockwise or anticlockwise rotation direction and according to the rotation speed. This mode guarantees a slightly higher precision when using an optical encoder. 1 = ENDLESS MODE 2 – the output MIDI message has a DataByte_2 with a value corresponding to 0 or 127 according to the clockwise or anticlockwise rotation direction. this is the most commonly used mode to check the parameters of a software, and certainly the most recommended. 2 = POT EMULATION – the outgoing MIDI message will have a DataByte2 that gradually passes from the minimum value to the maximum value (0-127) exactly as if you were turning the knob of a rotary potentiometer. 3 = SCALE LEARN – By turning the spinner in combination with the touch sensor it is possible to record and play a scale of notes. The reference source for recording scale notes is the USB or DIN MIDI input, but also the same keys on the Dart device panel. up to 6 notes can be recorded. the TOUCH-OFF condition resets the recorder. It is also possible to write a sequence of fixed notes using the DART_EDITOR: to do this, set the SPIN_MODE selector to 2 (pot) and set the TYPE selector to NOTES. each slot corresponds to one of the 12 notes that can be turned on in a scale..
TOUCH STOP – the touch-stop function is related to the touch sensor, it will stop the flow of midi data produced by the rotation of the Spinner, when the touch sensor is Released. This is useful to have more precision and control over a parameter, avoiding the inertia of the spinner to influence a parameter. 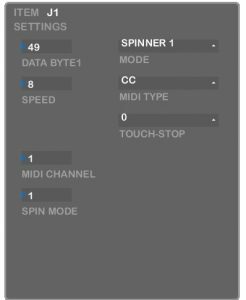 If the spinner is set in ENDLESS mode, the touch-stop function will TRANSLATE the data to the upper MIDI Channel, at TOUCH_ON condition. So the unwanted MIDI signal portion can be ignored or used, depending on the channel. 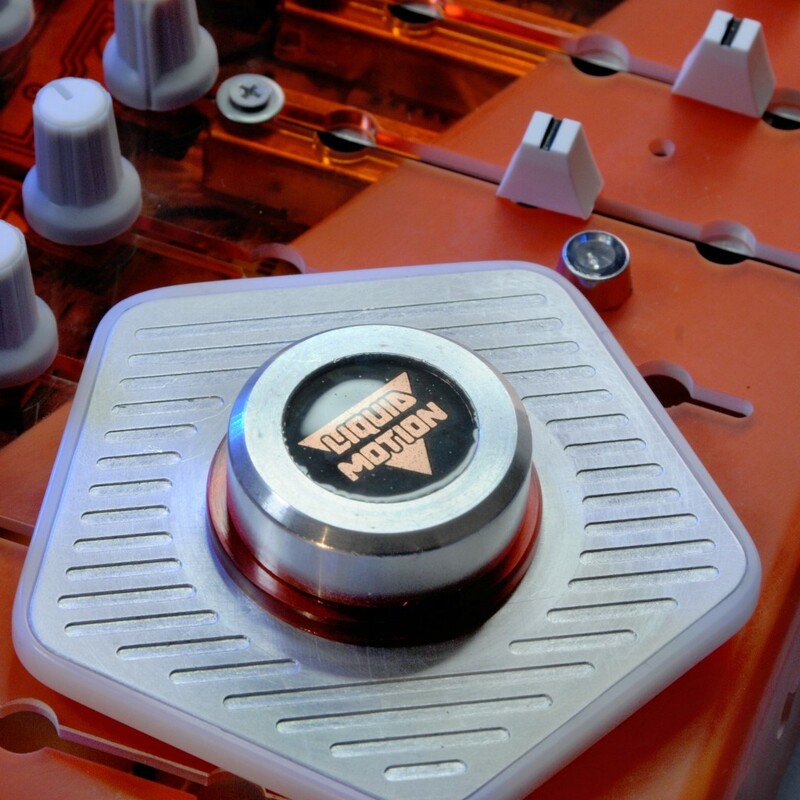 If the spinner is set in POT mode, the touch-stop function will STOP the data output, on TOUCH_OFF condition. If SPIN MODE is set to POT MODE or SCALE MODE (2 or 3) the SPEED selector will determine how many encoder revolutions will be needed to go from the minimum value to the maximum value. 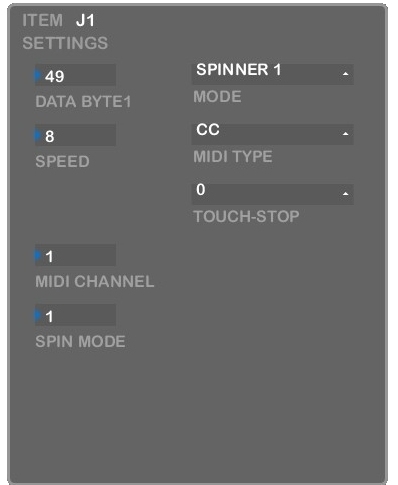 If SPIN MODE is set to ENDLESS MODE ( 0 ro 1) the SPEED POLARITY will control the direction of the MIDI Data Byte 2 output (for example : 0-127 or 127-0) . The SPEED AMOUNT will determine the speed of the LED light effect of the spinning (faster or slower effect) and not the rate of the emitted messages. 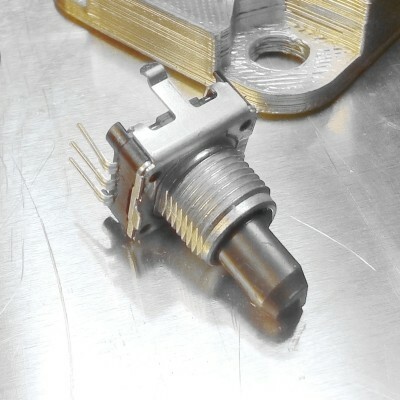 the DIN MIDI OUT connector of the Dart controller in connected to the DIN MIDI INPUT of the Roland Super JX synth, so the synth can be played from the dart controller buttons. the DIN MIDI OUT of the Roland Super jx is connected to the DIN MIDI INPUT of the Dart device, so the keys that are pressed on the synth keyboard will produce a visual effect on the Dart panel: the LED corresponding to each note will light up. on the first preset_page of the Dart controller, the TOP and SIDE sinners are set to emulate a Pitch Bend lever. Using the TOUCH RESET function it is possible to rotate the spinner to modify the pitchbend parameter and when the touch sensor is released, the pitchbend parameter is reset to an intermediate position. this function can be accessed fron the Touch Sensor settings ITEM. 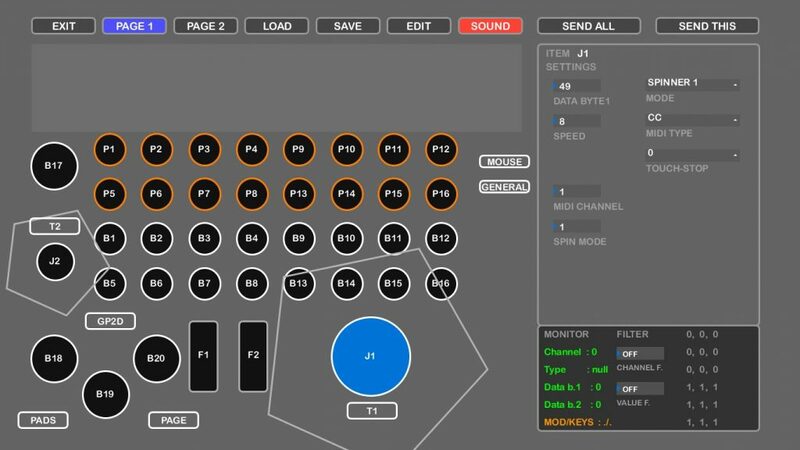 on the second preset_page of the Dart controller, the TOP spinner is set in SCALE LEARN MODE, so the touch sensor can be used to record a scale of notes, that can be played through the spinner rotation. the spinners are based on encoders. The clockwise or anticlockwise direction of an encoder is read by comparing the pulses sent by channels A and B; these readings are subsequently translated into MIDI messages. A DART controller can be equipped both with CONDUCTIVE and OPTICAL encoders. TOP and SIDE spinners CONNECTIONS. 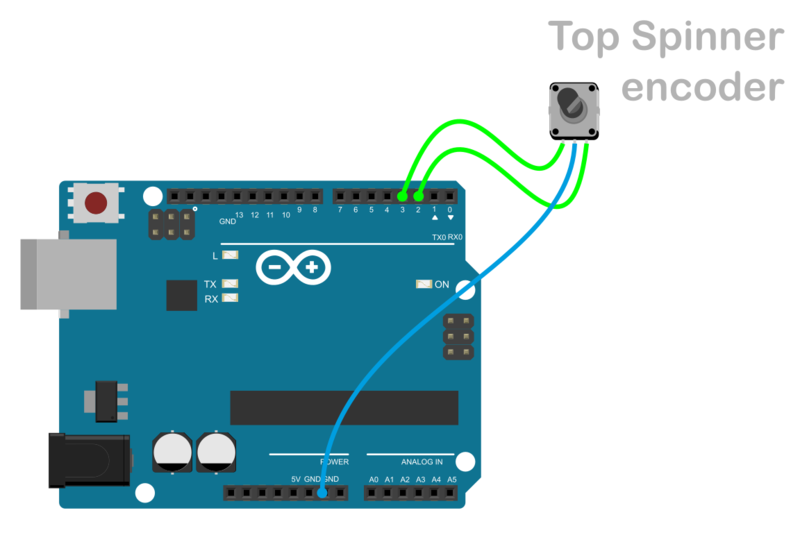 The Top-Spinner encoder is always connected to the Digital Pins 2 and 3 on the Arduino board. The readings of this encoder make use of the Arduino intrrupt function, for this reason they are faster and more precise: a good solution for reading optical encoders, such as those used on DART_Speciale. Two 10k Pull-Up resistors will improve stability. 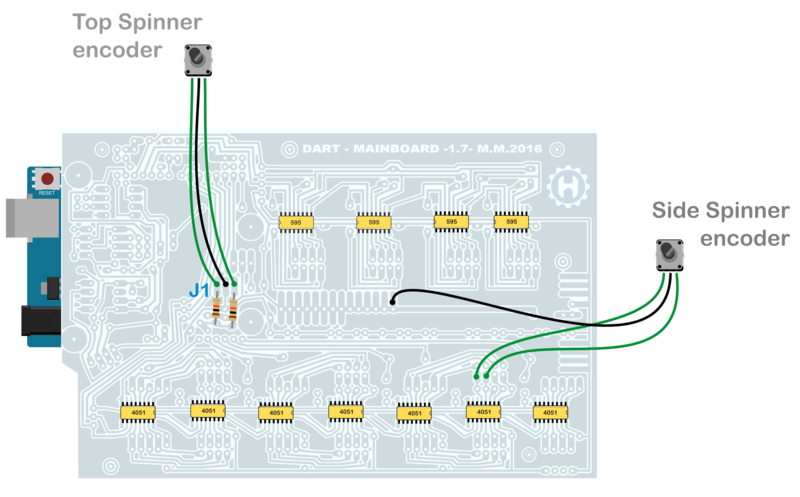 The Side-Spinner encoder has to be connected to Input Pins 41 and 42, on the DART_MOBO. 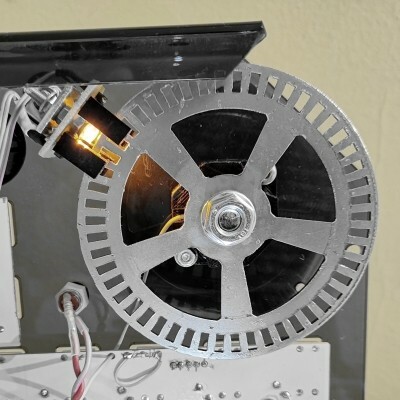 the reading accuracy of this encoder is slightly lower than that of the TOP SPINNER, it is not sufficient for an optical encoder, but it is more than enough to read a conductive encoder. The Side-spinner functionality has to be activated through the DART_EDITOR.